GSM operator MTS is the smallest one in Kosovo. Nevertheless, about 300 thousand subscribers enjoy its services and it has low rates for outgoing cellular communication. Having chosen a suitable prepaid package, you can earn good money on call termination. MTS SIM cards are sold all throughout the country. You can buy a prepaid SIM card at MTS stores or by contacting the dealers; the cost of one start plan is $ 2.7. Once having done that, you immediately get an initial loan of 23 cents on your account. By default, a minute of a call to any network costs $0.12. Also, after activating the SIM card, you can receive a welcome bonus - 10,000 minutes in the MTS network for 7 days. PRIPEJD NAJDRAŽI BROJ. Unlimited for any one number. Connection fee — $2.3. TRI OMILJENA BROJA. Unlimited for any three numbers. Connection fee — $3.7. INOCALL TARIFNA OPCIJA. Favorable tariffs for calls to overseas numbers. Connection fee — $1.4. Unfortunately, these plans will not be good for traffic termination. The best choice for operating in this area will be the PREPAID MTS start plan and activation of the welcome bonus. 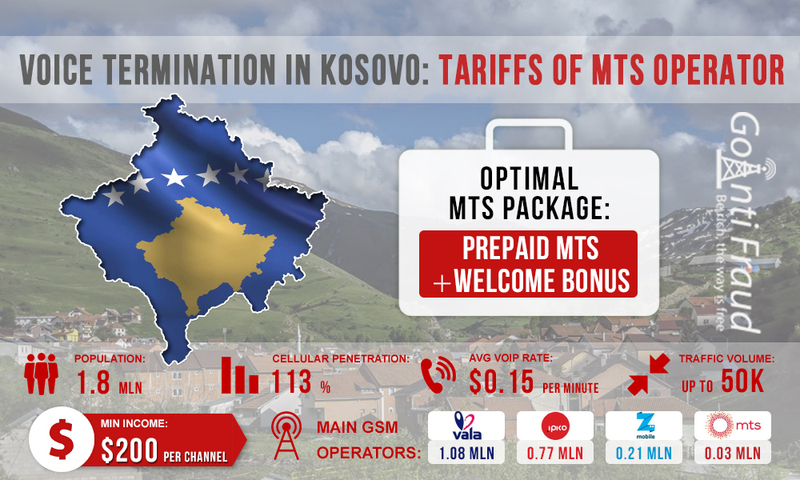 With average voip minutes rates in the direction of Kosovo being $0.15 per minute of conversation, the minimum earnings of the terminator will be $800 (provided that VoIP GSM equipment operates for 5 hours a day). Please remember that consistently high profits in high-rate countries are only possible with effective bypass of the operator's antifraud systems. Use GoAntiFraud tools to ensure reliable protection of the subscribers' numbers from blocking.